"Don't you ever feel so happy that you just want to dance all around the room?" Even in his sixth decade, Fred Astaire remained just about the most dashing, debonair man on screen�nobody before or since moved with the same elegance and grace. He's gone, and we're unlikely to look upon his like again; but hey, that's what DVDs are for, yes? Silk Stockings is in many ways the last of its kind, a great big musical with an old-fashioned score, a stage pedigree, and the best leading man in the history of movie musicals. Based on Ernst Lubitsch's comic gem Ninotchka, Cole Porter provided the music, and two of the very best musical-book writers, George S. Kaufman and Abe Burrows, contributed to the script. As so many Porter stories are, it's set in that den of iniquity, Paris, where film producer Steve Canfield (Astaire) has lured one of the brightest lights of Soviet classical music, Boroff (Wim Sonneveld), to write the score for his upcoming musicalized version of War and Peace. Three bumbling and ineffectual apparatchiks have been deployed to Paris to bring back Boroff, but when it's clear that their mission is a failure, the comrades back in the U.S.S.R. dispatch their ace in the hole: Comrade Yoshinko. Yoshinko—a.k.a. Ninotchka—is a fierce Stalinist from the neck up; but what the men in Paris notice is not her ideology, but how she fills out her state-issued uniform. Ninotchka is played by Cyd Charisse, who's got quite a pair of gams, but in many ways this is a thankless role: it was originated by Greta Garbo, and Charisse is a trooper, but doesn't even come close to eradicating the image of Ninotchka as originated by one of the great screen goddesses. This being a musical, pheromones triumph over propaganda, and Canfield and Ninotchka dance their ways into one another's heart. All of You is probably the best song in the score, and Astaire of course sounds and moves wonderfully. But there's something a little sad going on here, too—by 1957, Elvis was on the scene, Astaire's heyday seemed to have passed, and the future of the old-fashioned musical seemed very much in question. So there are a couple of half-hearted efforts to re-invent Astaire for the teenyboppers—a number called Ritz Roll and Rock features him in his trademark top hat and tails, dancing to a song infused with a rock beat. It succeeds neither as an Astaire number nor as a rock number; it just sort of sits there. Stereophonic Sound is a similarly tepid song, stopping the plot as it looks to make hay of the many technological innovations designed for the movies to compete with television: CinemaScope, VistaVision, Technicolor, etc. You'd think that the Cold War stuff would have aged especially badly—the comrades parroting the party line while engorging themselves on the sins that Paris has to offer—but given the stash of Danielle Steel novels and crappy videos that came tumbling out of Saddam Hussein's bunker, it's an indication that human nature, especially those of preaching virtue and practicing tyranny, never changes. (Some of the stuff is a little clunky, though: "Where is the little comrade's room?") In a truly bizarre bit of casting, Peter Lorre plays one of the apparatchiks—you probably never longed for the chance to see him sing and dance, but here it is, anyway. So the story all in all is a little silly, but Charisse and Astaire sure can dance, still. Hermes Pan, the choreographer responsible for so many of the earlier great Astaire musicals, works some magic here; the plot is plausible enough to get us from song to song, and even if on paper you may wonder why Ninotchka falls so hard for Steve, on screen it's abundantly clear: because he's Fred Astaire, and there's nothing wrong with that. Image Transfer Review: The supplemental materials relate the fact that the filmmakers weren't happy with having to use the CinemaScope aspect ratio, and it shows�two dancers, even two as graceful as Astaire and Charisse, can't fill out the whole screen. Still, this transfer to DVD looks pretty fair, with only the occasional scratch and bit of dust interfering with the overall visual presentation. Audio Transfer Review: The new 5.1 soundtrack show off Porter's songs to especially good effect, and the effort gone in to remixing this has paid off handsomely. A small amount of ambient noise and the occasional pop are the only marks against it. Extras Review: Cyd Charisse (who seems to have had quite a bit of work done) hosts Cole Porter in Hollywood: Satin and Silk (10m:14s), which runs through some basics on the production, and includes the only clips of Ninotchka you'll find on this disc. The director and choreographer weren't especially enamored of the CinemaScope aspect ratio—too damn much frame to fill up—and Charisse looks back on the film fondly, saying that "To this day, Ninotchka is still my favorite role." Another featurette (09m:07s) offers the MGM Symphony Orchestra playing Franz von Suppé's Poet and Peasant Overture, in a strange mix of high and low culture. Much more fun but not especially relevant to the feature is Paree, Paree (21m:02s), a short from 1934 set in the City of Light and featuring songs by Porter—it stars a very young Bob Hope, who is struck by the thunderbolt of love, and vows to his pals that he can woo the woman of his dreams (Dorothy Stone) without his fortune. It's extraordinarily silly—it's the kind of thing where a kickline of chorus girls show up at a café, with their own drums—but it's full of charm, especially with Hope singing You Do Something To Me, in a style reminiscent of Rudy Vallée. 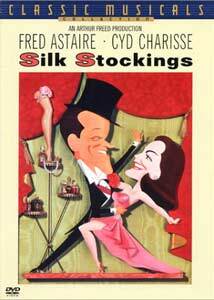 It doesn't sparkle as brightly as the Lubitsch original, and it may not be grandest entertainment ever put on by the composer or leading man, but Silk Stockings is a handsomely crafted effort from a bygone era of filmmaking, and looks and sounds swell on this disc.